Thomas Quasthoff (born November 9, 1959) is a Germanbass-baritone. Quasthoff has a range of musical interest from the Baroque cantatas of Bach, to lieder, and solo jazzimprovisations. 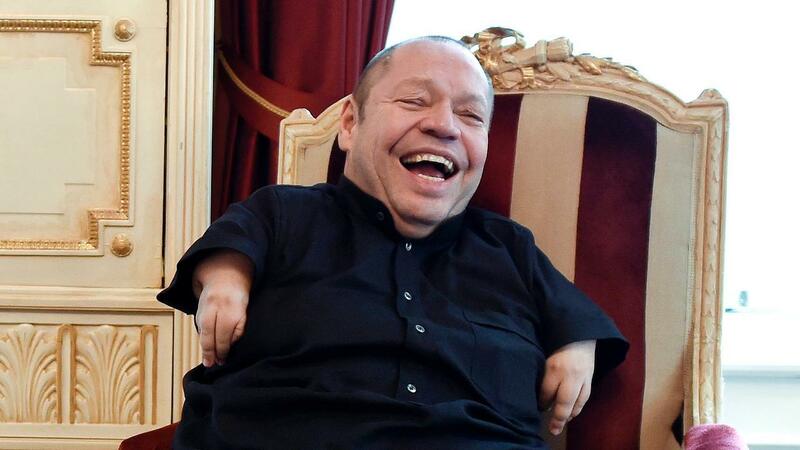 Born with severe birth defects caused by thalidomide, Quasthoff is 1.34 m tall (4′ 4¾”), and has phocomelia. Quasthoff was born in Hildesheim, West Germany, with serious birth defects caused by his mother’s exposure during pregnancy to the drug thalidomide which was prescribed as an antiemetic to combat her morning sickness. Quasthoff is 1.34 m (4′ 4¾”) tall, due to shortening of the long bones in his legs, and he has phocomelia of the upper extremities with very short or absent long bones. Quasthoff was denied admission to the music conservatory in Hanover, Germany, owing to his physical inability to play the piano, rather than a lack of skill required for entry to the conservatory. In the early stages of his education as a singer, Quasthoff was promoted by Sebastian Peschko. Thus, he chose to study voice privately. He also studied law for three years. Prior to his music career, he worked six years as a radio announcer for NDR. He also did voice-over work for television. Quasthoff’s music career was launched in 1988 when he won the ARD International Music Competition in Munich, earning praise from the baritone Dietrich Fischer-Dieskau. In 1995, he made his American debut at the Oregon Bach Festival at the invitation of artistic director Helmuth Rilling; in 1998, he was one of the soloists for the Bach Festival’s world-premiere of Krzyztof Penderecki’s Credo, the recording of which won a Grammy Award for best choral recording. In 2003, he made his staged operatic debut as Don Fernando in Beethoven’s Fidelio at the Salzburg Festival. conducted by Simon Rattle. Quasthoff recorded for Deutsche Grammophon. In addition to recordings of classical repertoire, he released his first jazz album for DG, The Jazz Album: Watch What Happens, with Till Brönner, Alan Broadbent, Peter Erskine, Dieter Ilg, and Chuck Loeb. For the 2006–2007 concert season, Quasthoff was one of Carnegie Hall’s “Perspectives” artists.However, illness forced him to cancel his first two appearances in that capacity. As “artist in residence” at the Barbican Hall, London, Quasthoff invited some of his favourite fellow artists in a series under the title “Die Stimme” – The Voice (also the name of his autobiography) which marked his 50th birthday year. Quasthoff was a guest of BBC Radio 4’s Desert Island Discs in February 2009. In January 2012, Quasthoff announced his retirement from public performance. He cited various reasons such as illness, the strains of touring, and the death of his brother Michael from lung cancer. Quasthoff is also a voice professor. He previously taught at the music academy of Detmold, Germany. He is currently a professor at the Hanns Eisler School of Music in Berlin. 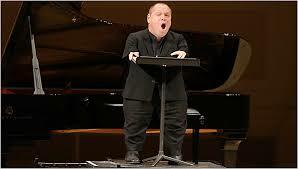 He has continued to appear in concert, notably as the speaker in Schoenberg’s Gurrelieder. Quasthoff won the Grammy Award for Best Classical Vocal Performance in 2000, for his recording with Anne Sofie von Otter of Mahler’s Des Knaben Wunderhorn, along with the Berlin Philharmonicconducted by Claudio Abbado. He won the Grammy Award for Best Classical Vocal Performance for the second time in 2004. It was for Schubert: Lieder with Orchestra which Quasthoff performed with von Otter and the Chamber Orchestra of Europe conducted by Abbado. Quasthoff won the Grammy Award for Best Classical Vocal Performance for the third time in 2006 with Rainer Kussmaul leading members of the RIAS Chamber Choir of Berlin Baroque Soloists in their recording of J. S. Bach: Cantatas. Quasthoff’s recordings of the songs of Brahms, Liszt and Schubert accompanied by pianist Justus Zeyen were nominated for the Grammy in 2000 and 2001. In 2008, he was a soloist on the Grammy-winning recording of Brahms’s Ein Deutsches Requiem (Simon Rattle, conductor; Simon Halsey, chorus master) on EMI Classics. In 2009, Quasthoff was awarded the Herbert von Karajan Music Prize. That same year he was awarded the coveted Gold Medal for “outstanding musicianship” by the Royal Philharmonic Society. In 2006, Quasthoff married Claudia Schtelsick, a German TV journalist. In a 2003 interview, Quasthoff revealed that he is an active political thinker, is a socialist, and was opposed to the Iraq War. He also expressed regret that the Israeli–Palestinian conflict could not be resolved via compromise.